Over the past few weeks we’ve been working with the council as part of their community engagement plan for the BreATHe project. 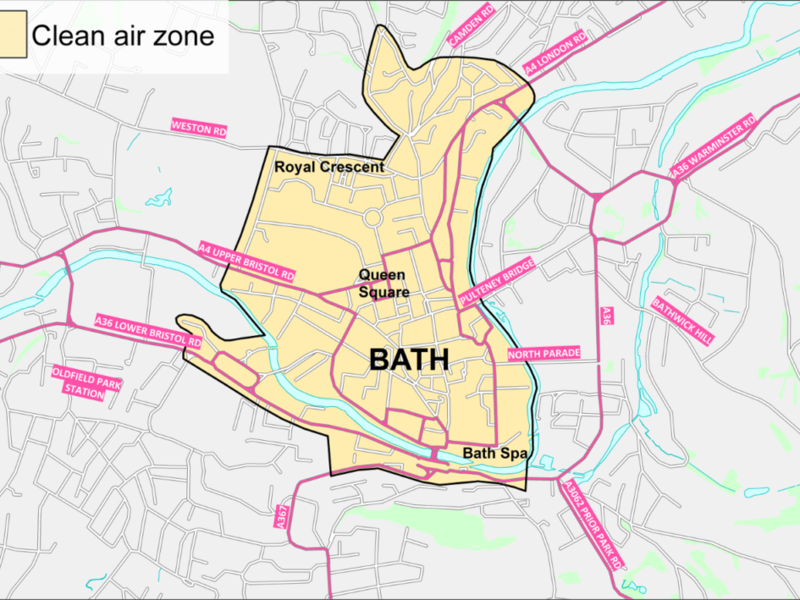 The consultation proposes a new Clean Air Zone for Bath to help address air quality issues. We thought we’d share what we’ve learned about Clean Air Zones to help inform discussion of the plans. As a community group, we’re interested in using and presenting data about the local area in ways that will inform debate and help us all to make better decisions about living and working in the area. This means that when key public consultations like BreATHe take place, we’re really interested in trying to find data and information that might be useful to residents, the council and other community groups to help us all have a productive discussion. We’re a group of volunteers who are also residents. We work independently and try to avoid politics when presenting our results. In fact, its one of our golden rules. The planning and proposals for the BreATHE project have also involved a lot of data collection and analysis. This creates a specific opportunity for us to help explore that data, both with and on behalf of the local community. In short, we’re keen to use our data skills to learn more about the planning and impact of the proposals. So that’s why we’ve been working with the council to publish some of the data that supports the consultation, and have been working with the community to explore it. You can see some of our early results here. With think there’s a lot more we can do, so are continuing to explore the data. As part of this work we’ve been reading up on Clean Air Zones, to understand what they are, how they are designed and enforced. We thought we’d share some background to help sign-post residents and other community groups to useful information. What are the key sources of information? The questions and answers in the rest of this post all draw on that information. If we’ve got anything wrong, then let us know! It’s an area in which some action is being taken to improve air quality. The activities are typically focused on trying to encourage a faster move to a low emission economy. For example by encouraging and supporting switching to lower emission vehicles, e.g. by adding restrictions to encourage only the cleanest vehicles to move around the area. What will the proposed Clean Air Zone try to achieve? Clean Air Zones are intended to tackle all sources of pollution, including nitrogen dioxide, particulate matter and carbon monoxide. In Bath, there are areas of the city where the nitrogen dioxide levels exceeds the EU and national legal limits. The zone is intended to address this as a priority. But may also help address other forms of pollution. Clean Air Zones are designed to tackle air quality issues in various ways. E.g. by encouraging people to change their behaviour by choosing alternative forms of transport. They can also create incentives that will encourage people and businesses to replace their vehicles with models with lower emissions. Does the council have to introduce a Clean Air Zone? Because Bath has areas where nitrogen dioxide levels exceed legal limits, the government have ordered the council to take action as quickly as possible. This directive was part of the 2017 national Air Quality Plan for Nitrogen Dioxide. B&NES is one of 29 local authorities, including Bristol City Council, that have been ordered to take action (see page 30-31). The directive set out a timescale for plans to be published. B&NES need to complete their final plans by December 2018. Individual councils make their own plans based on local needs. As described in the consultation documents, B&NES currently believe that the quickest way to achieve this is through the creation of a Charging Clean Air Zone, as well as a number of other supporting measures. The additional measures include walk to school schemes, extended park and ride hours, additional cycle parking, etc. Are Clean Air Zones effective? This BBC Reality Check article provides a good summary of evidence. They conclude that: “well designed clean air zones that impose charges on drivers of older vehicles have already reduced PM pollution and may do a better job of reducing NOx emissions once more effective standards for diesel vehicles have been introduced“. Do Clean Air Zones always involve charges? No. A Non-charging Clean Air Zone just defines an area in which a local authority is actively trying to improve air quality. Charging Zones are those where vehicle owners are also required to pay a charge to enter or move within a zone, if their vehicle doesn’t meet the standards set for the area. Clean Air Zone proposals don’t have to include a charging zone. The Clean Air Zone Framework describes operational standards and requirements for charging zones. These requirements give B&NES some options for how they design the zone. But also include some restrictions that limit their options. Guidance from the Joint Air Quality Unit at Defra says that: “charging Clean Air Zones (CAZs) should only be implemented if non-charging alternatives have been found to be insufficient to bring about compliance with air quality limits in the shortest possible time“. Local authorities must make it clear why a charging zone is required and explain rationale for pricing in their business case. Which area of the city will be covered by the Clean Air Zone? The boundary of the zone hasn’t been fixed yet. It’s still a proposal. We’ve created an interactive version of the proposed boundary to make it easier to explore. How does the Clean Air Zone relate to the Air Quality Management Area? An Air Quality Management Area is an area in which a local authority is monitoring air pollution. The Air Quality Management Area for Bath covers the major roads across the city. We’ve created an interactive version of the Air Quality Management Area, so you can see the area it covers. How are Charging Clean Air Zones enforced? Automated Number Plate Recognition (ANPR) cameras will read vehicle number plates. Using information on the vehicle make and model, as well as other data such as whether the vehicle is licensed as a taxi or private hire vehicle, the council can then determine whether there is a charge to pay. Introducing the zone will require the installation of a network of ANPR cameras around the city. These will likely be at the boundaries of the zone, key junctions and car park entrances. Enforcement of a zone involves identifying cars moving into and around the Clean Air Zone. Cars that remain parked won’t be charged. The council have published a series of questions and answers that touch on enforcement and charges in their FAQ document. These are worth a read. How can I check whether I will be charged? The RAC have some guidance on working out how you car compares to the EU emissions standard. There are some online tools to help, but it seems like there are a number of caveats with these, so may not be accurate. For now it seems like checking your vehicle logbook or asking the vehicle dealer or manufacturer is your best option. We don’t think this is ideal, so we’re trying to find better information. Whether this would be appropriate for Bath will depend on a number of factors, including how much of the air pollution is caused by local versus visitor traffic, residents ability to change vehicles, options for alternative transport, etc. The proposal indicates that, subsequent to funding, B&NES propose to off “financial support schemes for residents and businesses that need it most”. Will people with disabilities be charged? No. There is a national exemption which means that vehicles within the disabled passenger vehicle tax class will not be charged. In the proposal for Bath, B&NES have indicated that “Vehicles driven by disabled people” will be exempted. Charges for blue badge holders driving Euro 4/5 diesel vehicles will be delayed until January 2022. As will charges for accessible taxi and private hire vehicles in the same class. Will ambulances and other emergency vehicles be charged? The Clean Air Zone Framework requires local authorities to liaise with emergency services to understand impacts on their fleet of vehicles. Some emergency vehicles are exempt from charges. In other cases an agreement has to be reached around how other vehicles might be charged. In the proposal for Bath, B&NES have indicated that National Health Service vehicles will be exempt. So ambulances won’t pay. Emergency service vehicles will be exempt until 2025. Euro 4/5 diesel vehicles being used by registered healthcare providers will not be charged until January 2022. Will taxis and private hire vehicles be charged? Yes. But in the current proposals, there are some concessions. Euro 4/5 diesel accessible taxi and private hire vehicles will be not be charged until January 2022. Other taxi and private hire vehicles in the Euro 5 class will also be exempt until 2022. Can the council just choose to charge particular types of vehicle, e.g. only coaches and LGVs? The zone has to apply to one of these pre-defined classes. A local authority can’t just mix and match different types of vehicles. What happens to the money raised by the Zone? There are limits on what the council can do with any revenue generated from the Clean Air Zone. There is legislation (specifically, the Transport Action 2000) which requires any excess revenue from road user charges must to be spent on achieving local transport policies. The revenue could be spent on supporting the implementation of the proposed supporting measures. The council could also invest further in local schemes to improve transport and air quality. Where can I go to share my opinion? The proposal by BANES Council seems to suggest the minimum action needed to escape any further criticism. I understand it will not come into effect until late 2020 and so feel any positive impact is being pushed back needlessly. with the advent of the ‘Extinction Rebellion’ movement I feel this proposal is generally weak.